I have previously taught you how to embed YouTube videos in a RoboHelp project. While immensely popular, YouTube is not the only video site. This week, let's focus on embedding videos located on the Vimeo website. First, access the Vimeo site, locate the video you'd like to use, and then click the Share button located on the video. Next, go to the Embed field and copy the embed code. Now that you've got the embed code copied, the rest of the work occurs in RoboHelp. Go ahead and open a RoboHelp topic, switch to HTML mode, and then paste the embed code in the topic as shown below. Lastly, you'll need to edit the HTML just a bit. In the src attribute, type http: in front of the url. Save the topic, generate the layout, and open the topic in your browser to see the embedded video. Note: Vimeo includes a hyperlink with a description below the video. Retain this link unless you have the correct license for removing it. Looking to learn RoboHelp? We offer a live, two-day online RoboHelp class once a month. Feel free to contact us to learn other ways to meet your RoboHelp training requirements. You can easily insert videos into Storyline from just about any video format. All you need to do is click the Insert tab on the Ribbon. From the Media group, click Video drop-down menu and choose Video From File. I was working on a project recently and inserted a video onto one of my Storyline slides using the step above. Upon previewing the slide, I saw that a portion of the video needed to be trimmed. Fortunately, trimming a portion of a video is just as easy as inserting a video... and you don't have to leave the Storyline application. First, select the video on the slide. Next, click the Video Tools Options tab on the Ribbon. At the left of the Ribbon, click Edit Video to open the Articulate Video Editor. Once you're in the Video Editor, click Trim. By default, the first and last half-second of the video is selected for Trimming. 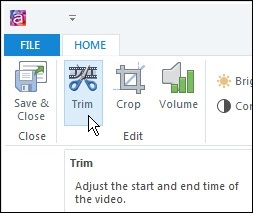 All that you need to do now is extend or reduce the Trim Start and/or Trim End markers as needed to specify the areas of the video that need to be trimmed. When you're done, click Save & Close and the video is trimmed. It can't get much easier than that. If you'd like to learn more about eLearning, come hang out in my next eLearning basics mini course. And if you'd like to learn more Adobe Captivate, Adobe Presenter, or Articulate Storyline, we've got a great collection of live, online classes for you. iPhoneography and Mobile Photography offer an endless array of apps to edit and enhance your images, as well as combine them and create artwork that can be posted online or printed and framed. During this class, you will learn tips for using your phone’s camera and for getting better shots. Then we will explore some of the best apps on the market for creative photography, available on a variety of platforms including iOS and Android. Live, online, and 100% interactive! 3-hours of content... and just $79! Whether you are in the market for a new job, just starting your career, or are a well-established professional, LinkedIn is one of the most important tools for establishing your online presence. Good practices from the start help you to “brand” yourself & determine what kind of message you want to offer about yourself to the world. During this class, you will learn to use the most powerful features of LinkedIn to get your profile noticed. You will discover best practices for creating an online presence, learn about privacy and other settings, get tips on networking and protecting your online reputation, and more. The class will use a series of worksheets (provided) for exercises in gathering keywords, writing your summary, and listing your skills and strengths. We’ll do some fun group exercises to get everyone thinking of how to improve their own profile. This week let's explore some common cultural facts about Panamanians and their expectations when it comes to Training and Development. Is Panama part of Central America or Northern America? True or False? Panama has the same governmental structure as the United States, which includes a president and a vice president. Public criticism is frowned upon, as Panamanians work diligently to maintain an image of harmony. Be careful not to criticize students or team members in public; pull them aside and address concerns privately, if needed. Spanish is the official language, but English is commonly known. Training materials will likely be requested and better accepted in Spanish, even though English materials could be understood. Many Panamanians are highly sensitive about the influence of the United States on their country--whether perceived or actual. Even if influence by the United States seems apparent, don't mention it, as the commentary will often be met with disdain. Truth is strongly biased towards emotions rather than logic. Decision-making is commonly done in light of its effect on the group as a whole, and personal relationships are a vital part of daily life. Trust is freely given, but you may experience resistance as a trainer from the United States. While there is a wide gap between social classes, this difference is typically accepted by older generations. Younger professionals are starting to fight this cultural norm as they seek higher levels of success and affluence for their families. Machismo is prevalent, so students may inherently respond better to male trainers or leaders. To overcome this stigma, women can emphasize their role as part of a committed team. False. Panama is a multi-party republic and includes a president and two vice presidents. 1Morrison, Terri, & Conaway, Wayne A. (2006). Kiss, bow, or shake hands (2nd ed.). Avon: Adams Media. Developing international training and development materials? Contact Jen at Carmazzi Global Solutions. And if you love Jen's articles, check out her new Localization mini courses. 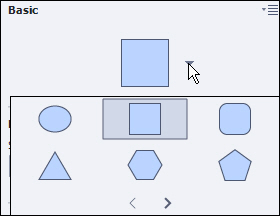 I've written about Captivate's Smart Shapes a few times since Adobe first introduced them. If you want to know what they are, check out this article. If you want to learn how to use Smart Shapes as buttons, I've got you covered. This time I'm going to cover how you can use Smart Shapes instead of Text Captions in just about every development scenario. Since Smart Shapes are far more flexible (when it comes to formatting) than standard buttons or text captions, I'd love to see Adobe completely replace text captions and buttons with Smart Shapes down the road (perhaps Captivate 9... 10?). As it stands, standard text captions are used whenever you record a software simulation or enable feedback captions for interactive objects (you can use Hint, Success, and Failure captions for Click Boxes, Buttons, and Text Entry Boxes). If you'd like to use Smart Shapes instead of Text Captions during the Software Simulation recording process, open Captivate's Preferences dialog box (Edit menu if you're using Windows; Adobe Captivate menu if you're using a Macintosh). From the Recording group at the left side of the dialog box, select Modes. Finally, for each mode you'd like to use, enable Add Text Captions and Use Smart Shapes instead of Captions. You can select the type of Smart Shape you want to use via the Smart Shape Type drop-down menu. When you record your next Software Simulation, the standard Text Captions will automatically be replaced with Smart Shapes. As I mentioned above, you can also use Smart Shapes instead of standard captions when adding Hint, Success, and Failure captions. It's a simple set up (assuming you're using Adobe Captivate 8.1), reopen the Preferences dialog box. From the Category list, select Defaults. Lastly, from the General area, select Use Smart-Shapes for SFH Captions instead of Text Captions. The next time you enable Hint, Success, or Failure captions for an interactive object (via the Properties Inspector), the feedback captions will automatically be Smart Shapes. If you'd like to change the shape of the Smart Shape, it's a simple matter of selecting the shape and, on the Properties Inspector, using the Basic drop-down menu. If you'd like to learn more about eLearning, come hang out in my next eLearning basics mini course. And if you'd like to learn more Captivate, Presenter, or Storyline, we've got a great collection of live, online classes for you. I totally agree with Michael. Moot is much different in meaning and sound than mute! And keep the "t" sound out of often! One of my pet peeves is the mispronunciation of the plural form of process. The correct pronunciation is pros-es-iz, NOT pros-es-eez. An online resource suggests that this new pronunciation is increasing in popularity, perhaps by mistaken analogy with such plurals as "theses" and "hypotheses," with which it has no connection. I've also heard users attempt to make a parallel to "matrices." Drives me nuts!! Right? That "eez" on the end always sounds a little pompous to me--but a trip to Merriam-Webster's New Collegiate Dictionary (Eleventh Edition) indicates that the long e is used equally often by educated speakers as the short e! But again, Webster's is descriptive, meaning it is a record based on observation of how people are actually using and pronouncing words, rather than an analysis of how words should be pronounced and used. So Julie is absolutely right that processes, from the Latinprocedere, has nothing in common with theses or hypotheses, which come from Greek words. Given that, together with my feeling that it is pompous, I would guess that the origin of this pronunciation is in hypercorrectness. Hypercorrectness occurs when people create "a nonstandard linguistic form or construction on the basis of a false analogy (as ... "widely" in "open widely")." In other words, when they try so hard to get it right that they get it wrong. The impact that the asteroid made when it hit the Earth 246 million years ago can still be seen today. The price of that new TV has an impact on whether people will buy it. I have a pronunciation pet peeve. It is "our." Most people pronounce it as "r," when it should be pronounced just like the word "hour"! Adobe FrameMaker 12 supports GREP Find/Change (General Regular Expression Print), but I tend to forget about it because it's not prominently featured in the Find/Change dialog box. One of my major headaches in a FrameMaker layout job is updating hyphens to en dashes between ranges of numbers, as outlined in my article on GREP in Adobe InDesign. Without the aid of GREP, I run 10 replacements, 1- to 1-. 2- to 2-, etc. It's tedious, but if I wait until I have all the files in the book, I can do it once and be done with it. Until today. Thanks to a series of misfortunate events which made me sit back and think, "Isn't there a better way? ", the lightbulb finally illuminated. A little voice piped up and said, "Barb! 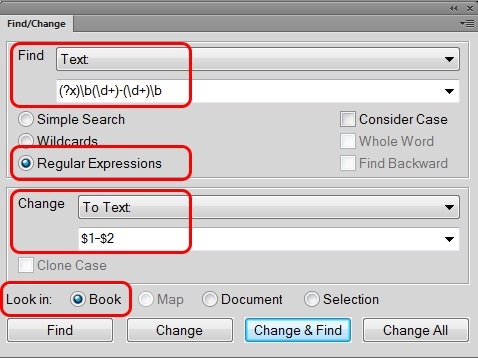 Copy the string from the InDesign blog post and paste it into FrameMaker!" And with one minor change, it worked perfectly. This simple GREP query will find all digits separated with a single hyphen and change those hyphens to en dashes. Now, if we could just get Adobe to add the widgets that make figuring this out easier and the ability to save these strings for future reference! Looking to learn Adobe FrameMaker? Check out our live, online FrameMaker classes. Articulate Storyline 2 Mini Course: Come Learn What's New! The Articulate folks have done it again... they've added some new and amazing features that we think will put a smile on the face of existing Storyline users and the eLearning development community in general. Attend this mini 3-hour course and get up to speed on Storyline 2's hottest new features and their practical uses. You will learn new ways to bring content to life, fine-tune the way your course looks and feels, and learn how to get your work done faster than ever before. Using hands-on exercises focus on Storyline's new features, you will walk away ready to take full advantage of this awesome update. Two of my current pet peeves are the misuse/overuse of the word "utilize," instead of "use" and the word "impact," instead of "affect" or "effect" (depending on whether "impact" is being used as a verb or noun). Why don't we utilize some of the empty classrooms as offices? We used three reams of paper to print the phone directory. On the word impact, however, I like to allude to the impact wars of the late 1980s. Sorry, Laura, but those of us insisting that impact is a noun, not a verb, long ago lost that fight. Webster's dictionary now lists impact as both a verb and a noun and has done so for at least 15 years. Not that many of us in the writing and editing business don't still protest that decision. When I double-checked Webster's just now, I saw a comment by a reader complaining that impact should be used only as a noun. Yep, many of us are still bitter over this. But we lost. Webster's is a widely respected dictionary, but it is descriptive, rather than prescriptive. That means it tries to reflect how people are actually using a word, rather than how people should use a word. And right now, Webster's solidly supports impact as a verb. Sigh. It's "business-ese" stuff like this that really annoys me. If people would just write more naturally, more like they talk (but with correct grammar), most of their writing would really be much better. Two pronunciation pet peeves: Saying mute when you mean moot. Pronouncing the t in often. Post your pet peeves below. I've got a bunch more stored up, and now we have the new category to add to: pronunciation. If you love Jennie's articles, you'll love her classes. Check out some of Jennie's mini courses.